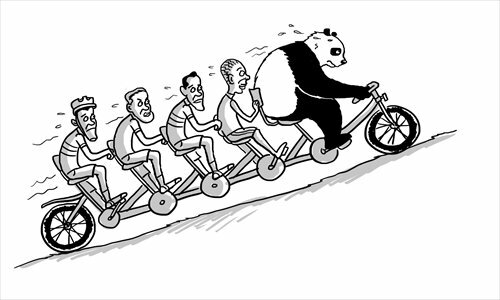 China is mis-read in the BRICS context. As the other four countries try to accelerate their growth paradigm and externalise the costs to other parties, China is already having to deal with the consequences of more than 30 years of rampant growth. Social cohesion, environmental degradation, over-production are China’s catchcries, but not so for the other BRICS members. China’s singular attraction is the availability of ODA funds but the world is currently awash with financial liquidity. The West’s private sector has funds aplenty, but is unwilling to invest whilst risk premiums are so high. They are waiting for firesales. China intends seeding the BRICS bank with $10bn, but it will need to be matched by other BRICS parties.